Well the off season has been busy with lots of discussion between Myself, Simmer Style WA, WWA and SBYC. Good news is that Jesper with Simmer Style WA is keen to sponsor the sailing again next season. 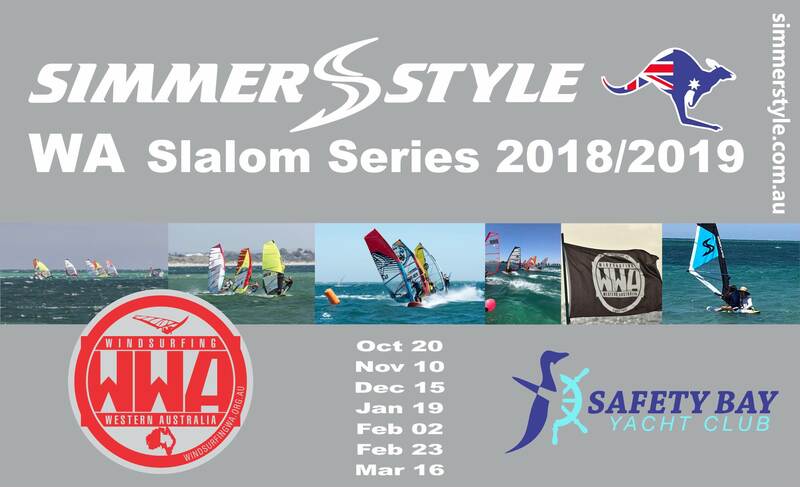 Jesper has been doing a lot of work with the Slalom and Junior fleets and is keen to promote windsurfing in WA so get behind the Shop that gets behind Slalom in Perth. There will also be a bit of tweaking with the scoring system next season. We will continue to see the heats seeded throughout the day. The first heat (historically not scored) will now be scored and seeded. So the winner of each 1st heat score 0.5pts, 2nd place score 2pts etc..
3 completed heats will constitute a completed round. If 4 or more heats are sailed then there will be a provision to drop the worst scored heat of the day. Hopefully this alleviates the big fluctuation in points if we have a bad first heat and will level the scoring out across all fleets. 3rd place =2034 and so on in increments of 33 points. Any sailor who registers for the racing but doesn't attend will score the lowest competing sailors score minus 33points. So anyone looking at becoming a member of SBYC or WWA members buying all-event ticket packs will be included in this scoring system.Ticketing and membership purchasing is still being finalised by the Crew at WWA so hopefully soon we can roll this out officially. On a personal note, I've really appreciated all the kind words and feedback I've received around the racing. Good to see so many new faces coming down but would be great to see more women participating. To all the girls who did sail last year, well done, but if you have partners, friends or family who windsurf or are looking at trying, we will always welcome and accommodate more ladies on the water. Also, I've volunteered some of my time as the Rear Commodore of SBYC for this season. Hopefully this will give the Windsurfing members and larger Safety Bay windsurfing community a voice on sailing in the area through the club structure. Look forward to seeing all of you back out on the water next season. Happy to join SBYC or whatever is recommended. How much is SBYC membership? $105 but i can't access the SBYC website right now to confirm. Will post correct fee once i can confirm. SBYC are finalising the membership form for 2018/19 season. You can obviously chose not to be a member of SBYC and again become a WWA member to sail. Tickets for racing will be available for WWA members through the WWA website as per last year. I'll post links to ll relevant membership sites once finalised. I strongly encourage anyone thinking of slalom racing this season to become a member. Not only is it a pretty good $deal$, you are also supporting a small, family orientated club who supports windsurfing in WA. is there an online portal to join/pay membership? Or at the club? There is an issue with the Club website. I'm expecting this to resolved shortly, however memberships can be paid at the club. Fantastic that you have this series. That's a bit peculiar - points for registering, even if you don't sail a single race in an event? What's the rationale here? Just curious.. It's mainly rewarding the sailors who back the event. Buying season ticket or memberships is a big commitment. Wind, weather, work and other things can get in the way. Historically, sailors wai until 2 days before an event runs before registering to ensure favourable conditions. This puts a lot of stress in the volunteers running the racing. If the incentive to buy tickets pre season is there I think it's reasonable to award points. New Banner thanks to Jesper! Dates are locked and loaded. Racing by WWA or SBYC memberships only. SBYC 2018/19 Membership Form still giving me grief on the SBYC website so if you want one PM me with your email address and i'll send one out. Again - Big Thanks to Simmer Style WA and SBYC and WWA for making the racing happen again. And Sail Stickers (below) will be available for sailors wanting these. For those wanting to know.